The League of Women Voters of Wisconsin takes our mission to educate voters by sharing candidates’ answers very seriously. So why exactly, if we only asked the candidates for the Wisconsin Supreme Court four questions, was one of them about something called “recusal?” In short, because it is a critical protection to ensure equal and fair justice in every courtroom in Wisconsin. For the non-lawyerly among us, “recusal" simply means to disqualify themselves from hearing that case due to an actual or perceived conflict of interest. If you like to think in terms of sports, think of recusal as if a referee is the best-friend of the Vikings head coach - they shouldn’t be allowed to call the Packers-Vikings game. If a judge has an investment in a company, or the company is a big-campaign donor, or the attorney representing them is the judge’s daughter, the judge should not be allowed to rule on the case. This is common sense for Wisconsinites. A poll in 2017 reported that 82% of us agree that judges should have standards regarding recusal. Yet, surprisingly Wisconsin’s justices are not in favor of requirements for transparency and disclosure of campaign contributions so the public can know which special interests are trying to influence the election and future court decisions. In their responses for the LWVWI candidate answers posted on VOTE411.org, judicial candidates clearly acknowledge that conflicts of interest are a serious problem for the fair and impartial execution for justice. But Wisconsin currently has the 47th weakest recusal rules in the nation. There are only very weak guidelines, very little transparency, and no system of accountability other than elections every 10 years to ensure that our judges are upholding the highest ethics on our courts. Whatever the conflict — whether its big-money campaign spending, a personal involvement, or even investments and personal financial gain — judges are currently allowed to determine for themselves when they should be disqualified from a case. But this is actually very easy to change. All it takes is for our state Supreme Court to adopt new, stronger recusal rules and those rules will apply to the whole Wisconsin judiciary. In 2009, following an important US Supreme Court decision involving a defendant’s $3 million contribution to a judge in a $50 million case (Caperton v Massey), LWVWI petitioned the WI Supreme Court to adopt standard recusal rules. The WI Supreme Court denied this request by a 4-3 vote. Then in 2017, 54 former Wisconsin judges thought it was so important to adopt an objective recusal standard — one where the rules are clearly spelled out and enforced — that they filed a similar petition with the WI Supreme Court offering suggestions on what those stronger rules might be and encouraging the court to adopt them. Despite receiving many more comments in support of the issue than any previous judicial petition, a majority of the court refused to even have a hearing on it. 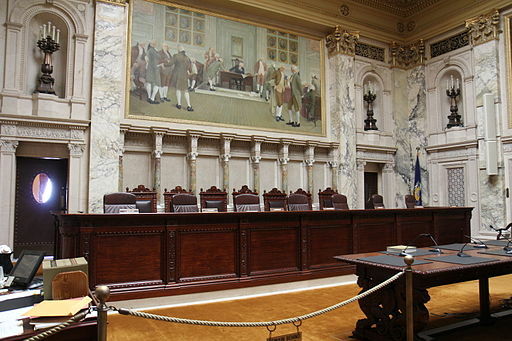 This year again, we see how critical the issue of judicial recusal can be to the administration of fair and impartial justice in Wisconsin that the League included it as one of only four questions asked of judges. It’s time this important issue received the type of attention from the WI Supreme Court as Wisconsin voters expect. Take a look at the judicial candidates’ responses on VOTE411.org before you head to the polls and consider this important issue when you vote next Tuesday, April 2. Erin Grunze is the Executive Director for the League of Women Voters of Wisconsin. The League of Women Voters of Wisconsin is a nonpartisan political organization that advocates for informed and active participation in government. There are 20 local Leagues throughout Wisconsin. More information at lwvwi.org.